Courtesy Oak Ridge National Laboratory. 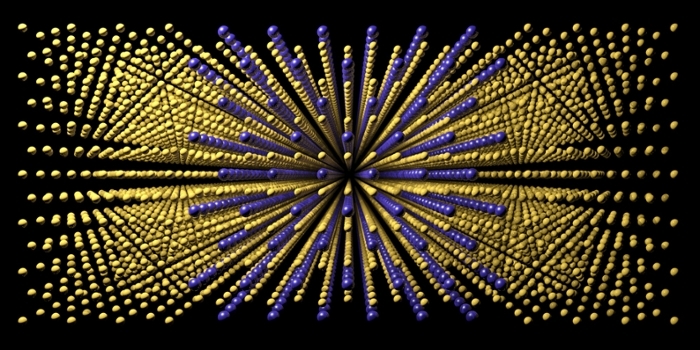 Using high-performance computing, ORNL researchers are modeling the atomic structure of new alloys to select the best candidates for physical experimentation in automobile engines. Public/private partnership to create lightweight powertrain materials and help the auto industry speed to 54.5 miles per gallon. 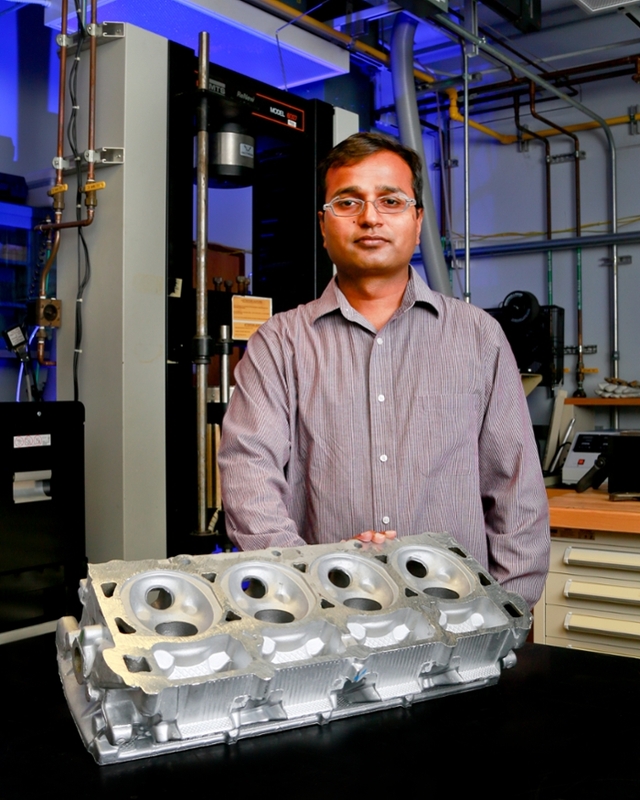 DOE-led team is developing new high-temperature aluminum alloys for automotive cylinder heads. Oak Ridge National Laboratory supercomputers model new alloys for further experimentation. The US Department of Energy’s Oak Ridge National Laboratory (ORNL), auto manufacturer FCA US LLC, and foundry giant Nemak of Mexico are combining their strengths to create lightweight powertrain materials and help the auto industry speed past technological roadblocks to its target of 54.5 miles per gallon by 2025. Automakers need powertrain materials that are lighter, low cost, and able to withstand the elevated temperatures and pressures in high-efficiency turbocharged engines. The typical development cycle takes 10 to 20 years, so there is little time to waste. “The aggressive goals of these projects compress about half a century of typical materials development into a four-year project,” says DOE program manager Jerry Gibbs. The ORNL-led project is part of a new initiative from DOE’s Vehicle Technologies Office. Ford, General Motors, and FCA US (formerly Chrysler) are collaborating with national labs, universities, and the casting industry to develop an affordable, 300º Celsius-capable (572º F) high-strength cast aluminum alloy. The partners aim for a material that is 25 percent stronger than current alloys, and durable at temperatures 50 degrees Celsius (122º F) higher — necessities for next-generation engines. The real challenge is to accomplish this while keeping costs low. The research team is using integrated computational materials engineering (ICME) to speed the development of new high-temperature aluminum alloys for automotive cylinder heads. ICME enables researchers to tailor new alloys at the atomic level to achieve desired properties like strength and ease of manufacturability. ORNL is breaking new ground by scaling ICME to run on DOE’s Titan supercomputer, the second fastest computer in the world. Using Titan’s speed and parallel processing power, ORNL researchers can predictively model new alloys and select only the best candidates for further experimentation. This predictive capability dramatically reduces the time, energy, and resources devoted to casting trial alloys. “Using approximately 100,000 cores simultaneously on Titan, we can increase the speed and scale of our first-principles quantum mechanics calculations by at least an order of magnitude,” says ORNL researcher Dongwon Shin. Before the shift to Titan, Shin was using a Linux cluster with approximately 300 cores to create atomistic simulations of single elements diffusing to intermetallic precipitates within the alloy. Now researchers can achieve larger scale simulations on Titan that are much closer to real world scenarios. The team is also verifying the computational models through atomic scale imaging and analytical chemistry measurements. ORNL’s scanning transmission electron microscopy and atom probe tomography allow researchers to identify and examine the location and chemistry of each atom in the alloy matrix, precipitates, and the interfaces between them. ORNL and collaborators are creating a database that captures their aluminum alloy materials discoveries. This materials genome approach will help guide efforts to improve ICME capabilities and accelerate the development of new high-performance materials. Funded by the Propulsion Materials Program in the Vehicle Technologies Office, the Oak Ridge Leadership Computing Facility approved six million hours on Titan for the ORNL alloy development project. The research uses microscopy resources at ORNL’s Center for Nanophase Materials Science.